Between October and December 1941 a number of aktions were carried out in Vilna in Ghetto I, during which thousands of ghetto residents were murdered. In October Gens requested that the Germans provide scheins (work certificates) for all Judenrat employees but received only 400. Dr Mark Dworzecki, a doctor in the ghetto, together with his colleague Dr Kolocner, waited tensely to hear which of them would receive a schein from the Judenrat committee. The two of us sat in the dark corridor in the Judenrat and waited to hear our fate. We conversed, at the same time each of us knowing that a certificate of life for one was a death sentence for the other… and they brought me a certificate for life – and my friend was sentenced - I was embarrassed to raise my eyes – and even so I took… my yellow certificate 777 – that was my certificate for life. The spouse of a schein holder was granted immunity, as were two of their children. There was great competition in the ghetto for a schein and fictitious family members were attached to schein holders. Younger brothers were registered as children, fathers as husbands and mothers as wives. There were schein holders who demanded money in exchange for being registered and the price of scheins soared. There were Jews who gave everything that they owned in exchange for a schein. On the 24th of October 1941 the schein holders and their families were ordered to present themselves at the ghetto gate in order to go to work. 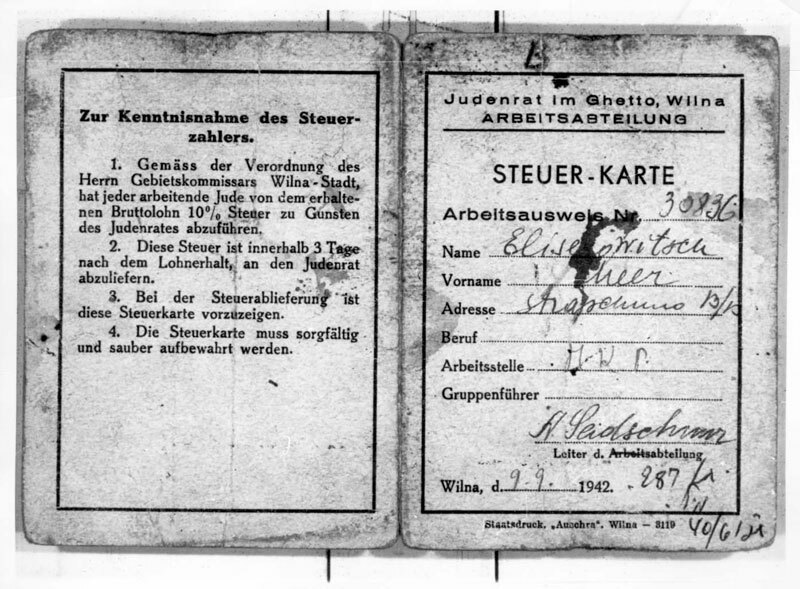 The Germans separated the Judenrat workers and their families and checked them. Those who were not registered were taken to Ponary and murdered. The rest went to work. The Lithuanians and Germans then entered the ghetto and took 4,000-5,000 Jews who did not have scheins to Lukiszki, from where they were deported to Ponary and murdered. The Germans ordered the resettlement of those without scheins to the area of the former Ghetto II which was now completely unpopulated. On the 29th of October the Germans rounded up and imprisoned the 1,500 deportees in Lukiszki; the following day they transferred them to Ponary and murdered them. On the 3rd of November the Germans informed all schein holders and their families that they needed to move to Ghetto II. Gens and the Jewish police checked the permits under the supervision of the Germans. A line of five people is walking: Husband, wife and three children… Gens counts "Father, mother, child, child." The third child, a twelve year old, he hits with a stick and removes from the line… and… marching in a line: a father, a mother and one child. Gens counts "One – father, two – mother, three – child," and suddenly he starts shouting a torrent of abuse at the father, "You fool, how have you lost your second son?..." and during the disturbance Gens places the crook of his staff around the neck of the twelve-year-old, whom he had previously removed from the line, drags him and attaches him as a fourth member of the family. And again he raises his voice… "You idiot, look after your son…"
Following the transfer of the schein holders to Ghetto II, the Germans and Lithuanians scoured the ghetto and sent any Jews they found hiding to Ponary. Two days later the schein holders were allowed to return to Ghetto I. They were not checked on their return and thus those who had been hiding out in Ghetto II since its liquidation were able to return together with them. On the 1st of December 1941, Murer, the German responsible for the ghetto, transferred the Ghetto II area to the Vilna municipality so that it could be prepared for non-Jewish residential accommodation. On the 3rd and 4th of December 1941 Germans and Lithuanians entered the ghetto and according to prepared lists took around 150 people with a criminal past to Ponary. Some of the deportees succeeded in escaping and returned to the ghetto. Jewish Gestapo workers were allowed to include on their scheins not only a wife and children, but also parents, brothers and sisters. On the 15th of December 1941 Germans and Lithuanians entered the ghetto and requested that the Jewish Gestapo workers accompany them. The people thought that the ghetto was soon to face another aktion and that 'their' Germans had come to remove them as they had done with the schein aktions. They were taken to Lukiszki and about 300 of them were murdered. About 200 were permitted to return to the ghetto together with a wife and two children. Family members of yellow schein holders were issued a pink "family permit" known as a pink schein. Professionals who did not have a yellow schein, former communal workers, rabbis and intelligentsia also received pink scheins and thus became "legal". The Judenrat distributed 1,600 pink scheins. 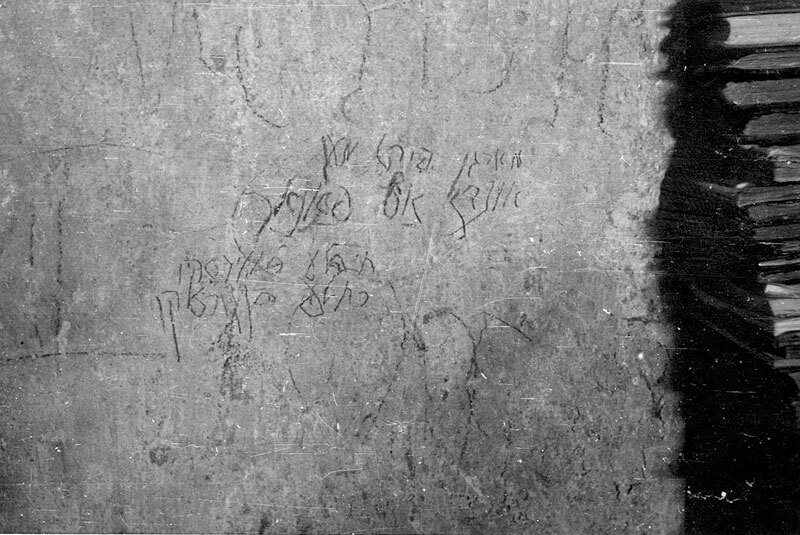 Thousands remained in the ghetto with a schein. On the 20th of December Germans and Lithuanians entered the ghetto. In three days they captured about 400 people who did not have scheins and sent them in trucks to Ponary. During the aktion the Lithuanians discovered two melinas (hiding places) in Spitalna Street . A number of people hiding in of one of the melinas, led by Moshe Haus and Goldstein, assaulted the Lithuanians and were shot during the struggle. Mark (Meir) Dworzecki was born in 1908 in Vilna and completed his medical studies at the University of Vilna in 1935. When the war broke out he served in the Polish army and was taken prisoner by the Germans. He escaped and returned to Vilna and worked as a doctor in the ghetto. His attempt to join the partisans failed. He was deported from the ghetto to a labour camp in Estonia. Following the liberation Dworzecki emigrated to Israel and was one of the pioneers in researching medicine during the Holocaust. He testified at the Eichmann trial. One of his books is about the history of the Vilna Ghetto "Jerusalem of Lithuania in Resistance and in the Holocaust" (Yerushalayim D'lita Ba'meri U'va'shoah) in 1953 he was awarded the Israel Prize for Social Sciences.